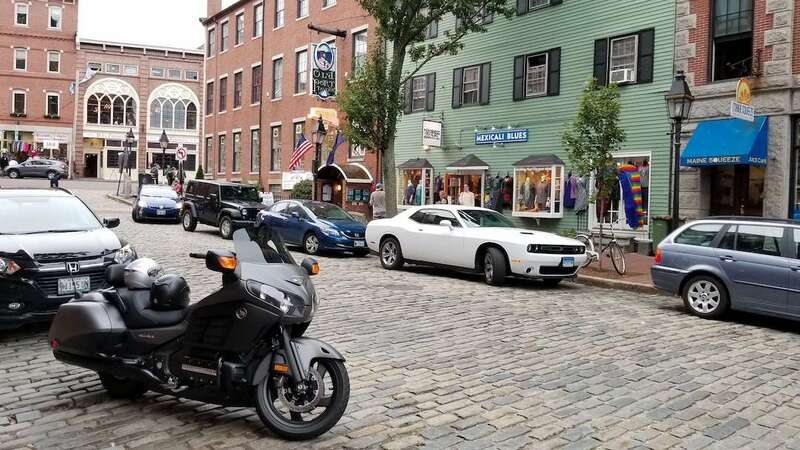 Portland Maine: A Foodie's Heaven - Eat See RV! We heard over and over again from friends and people we met during our stay in Maine, that Portland was amazing. Honestly, we weren’t ready for just how amazing it was. The food and drink scene is no joke. 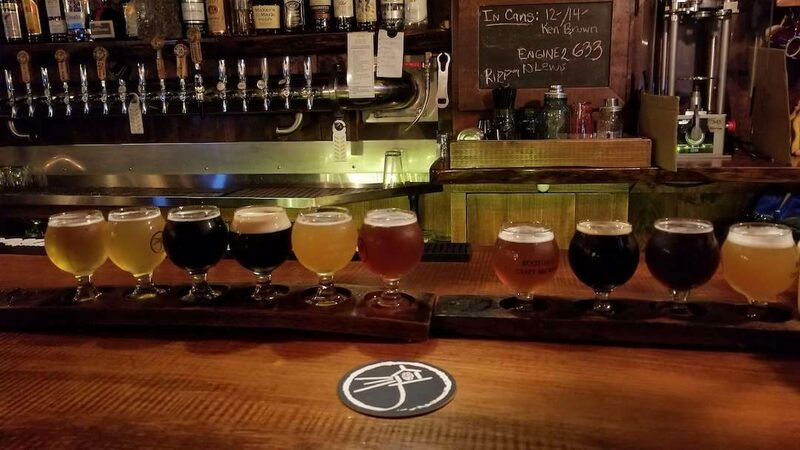 Having more restaurants and breweries per capita (that means restaurants and breweries to people who live there) out of any other city in the entire United States, they know a thing or two about good food and drinks. We stayed just under a week and enjoyed a lot of tasty bites and delicious brews. You’ll notice we didn’t do too much sight seeing. While there are plenty of things to do in Portland, we decided to spend our precious time doing what Portland does best – eating and drinking. Watch the video below! I wasn’t sure where to start: beer or food. 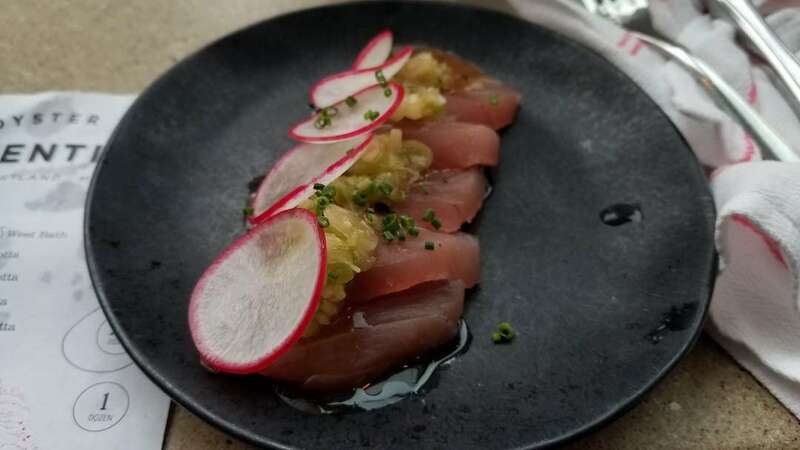 Both were amazing and readily available, but being the true food lovers that we are, I decided to highlight the incredible meals we had during our stay first! 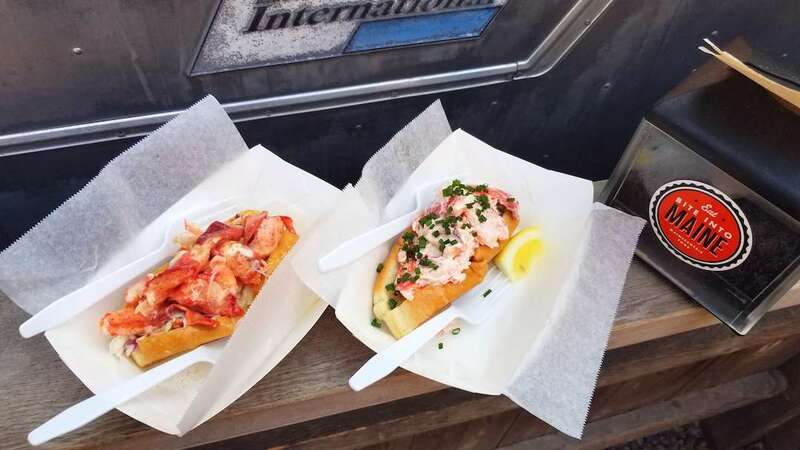 When in Maine, ordering a lobster roll (or two) is pretty much a requirement. There is no shortage of fresh lobster here, and they are not shy to say they do it better than anywhere else. I can’t say I disagree. While we did enjoy lobster in Bar Harbor and Acadia National (see the post here), we wanted to continue our lobster roll journey in Portland. 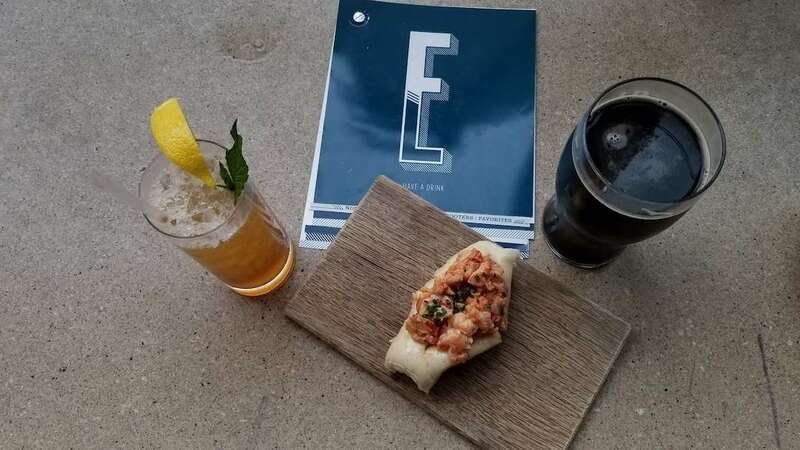 The best lobster roll to date was easily awarded to Eventide, a well known American Oyster bar that has a spin on the classic lobster roll. They make their own fluffy buns (similar to a boa bun), with lobster smothered in delicious butter, topped with a sprinkle of paprika and dash of green onions. It’s overwhelmingly small for it’s high price of $15 per roll and equates to about 2 or 3 bites total but is 100% worth a try. It was absolutely DELICIOUS! 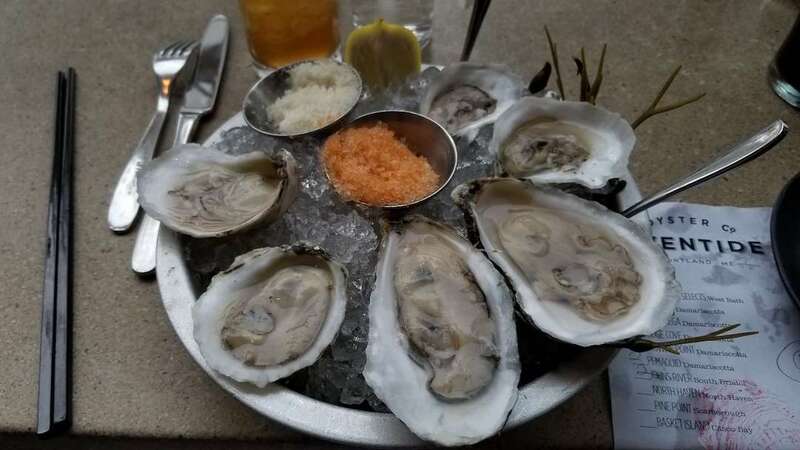 We also opted for fresh oysters which came from various areas of Maine, with kimchi “ice” – yum! We ordered another appetizer special they had on the menu that was equally awesome as the other items. I really think you can’t go wrong here. Point blank – go to Eventide if you’re visiting Portland. Our second favorite Lobster rolls of our stay in Maine, was in Portland as well. 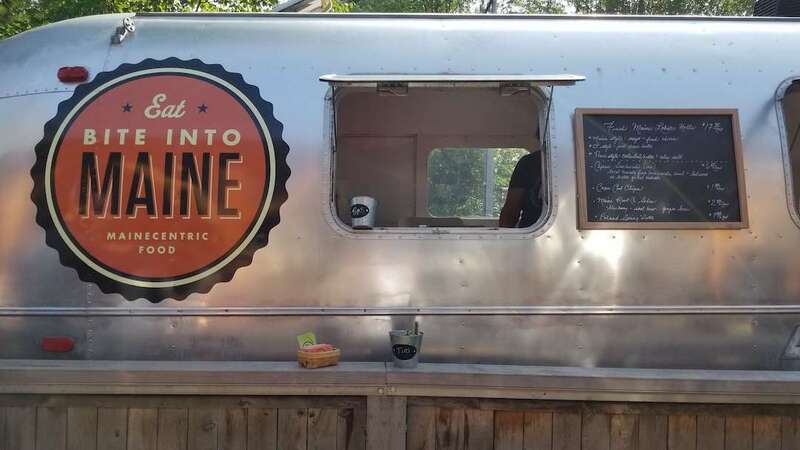 This time, it was a food truck serving up both traditional their modern take of the classic Lobster Roll. 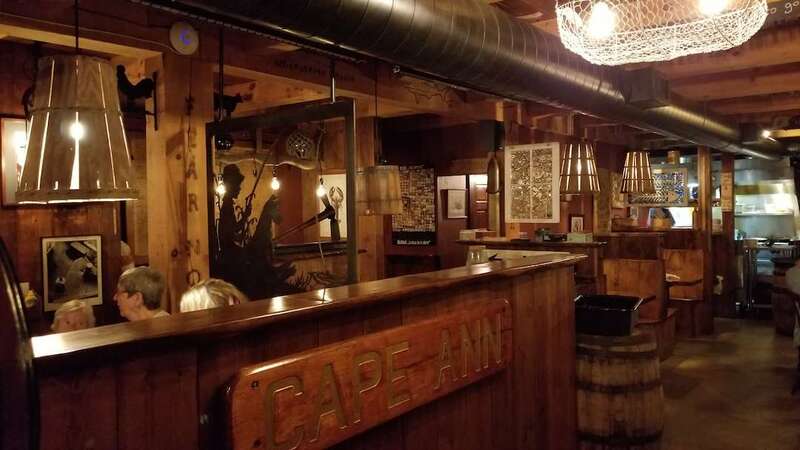 A Bite of Maine is well worth a visit and can easily be found at various breweries around town. We were lucky enough to enjoy their rolls at Allagash brewery. Our food exploration continued in the downtown area of Portland which is just outside of “Old Port” the more famous part of Portland and more touristy area. We heard of a restaurant that specialized in all things Duck – Duck Fat. Known for their french fries fried in you guessed it – duck fat, we had to try. 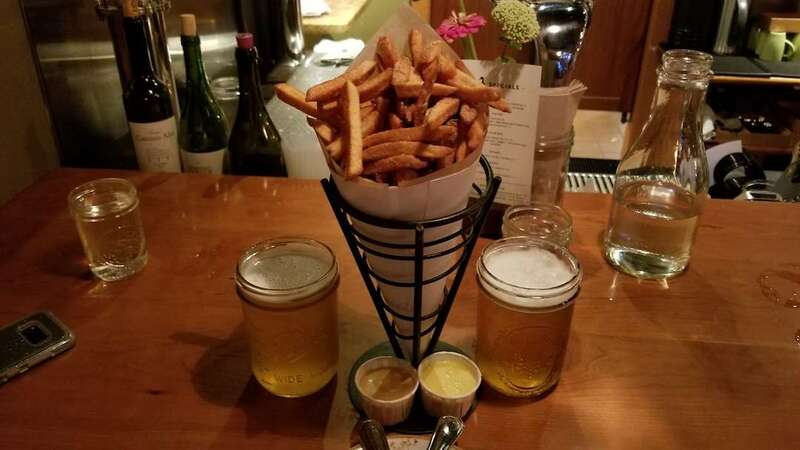 While Liz is technically vegetarian, she is willing to bend the rules a bit on something as amazing as french fries in duck fat. I mean come on…how could I resist?! 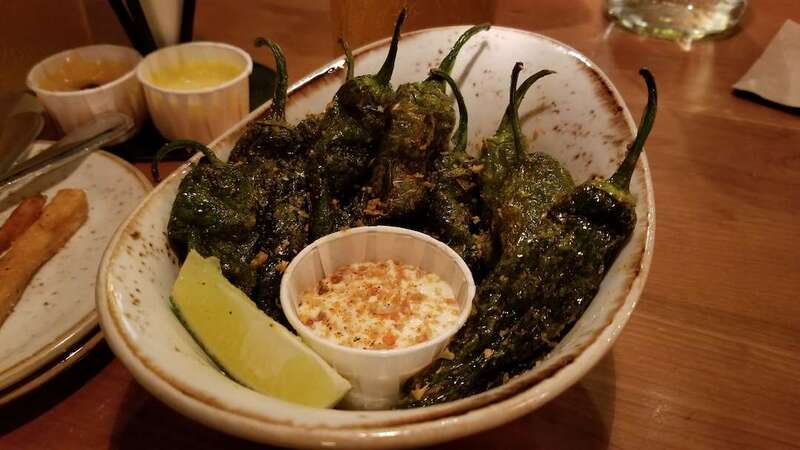 We also opted for shishito peppers fried in duck fat again (are you seeing a theme here)? We loved every darn bite. The last place we were lucky enough to enjoy was Pai Men Miyake. The vibe of this place was relaxed. You could tell they wanted it to feel like a no frills restaurant but deliver upscale food. 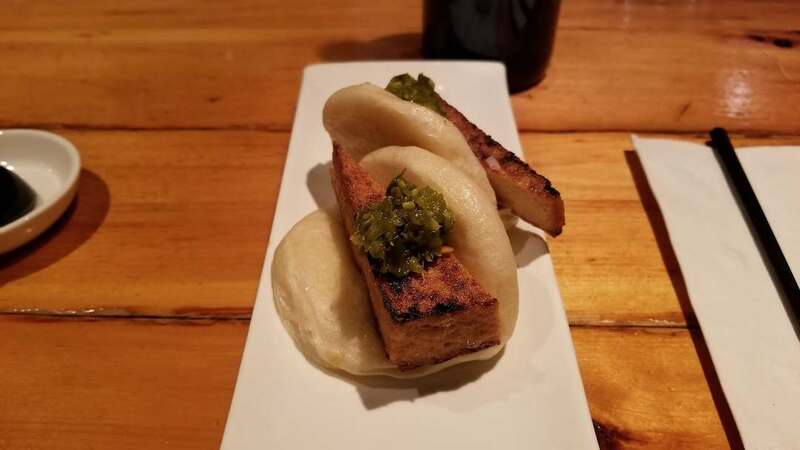 We appreciated that, and quickly fell in love after our first bite of our appetizer, a tofu boa bun. Ramen is probably Liz’s favorite food on earth. She could eat it every day…seriously. So of course, we had to order ramen. Dennis enjoyed his but has had better. Liz however, had the best bowl of Ramen she has ever tasted! Tokyo Abura ramen is a brothless ramen that’s flavor comes from a spicy chili oil and a raw egg (sounds weird but I promise it’s so so good). Our first choice for ramen that night was actually, Ramen Suzukiya. 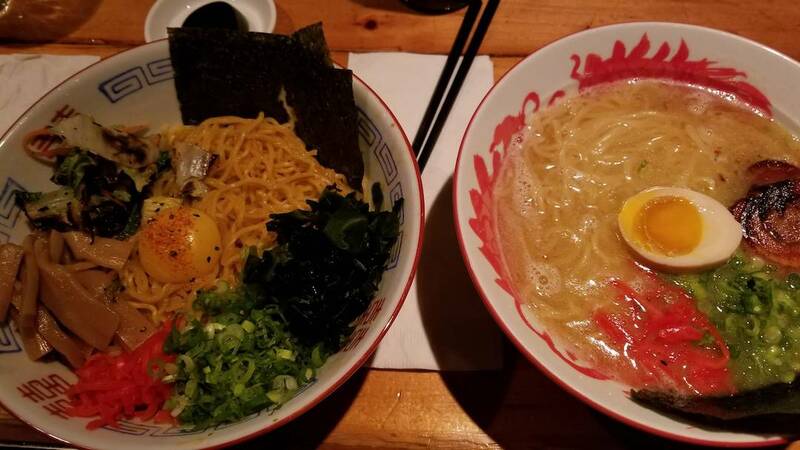 They are well known for the traditional ramen and freshly made in-house ramen noodles. We arrived about an hour before close, but they ran out of ramen noodles already! If you’re lucky enough to get a bowl of ramen here – please let me know how it was! We’re coming back just for this place. Okay, maybe not just for this place, we’ll be back for all of the goodness Portland is. We also heard great things about Cong Tu Bot, which offers killer vietnamese fair. 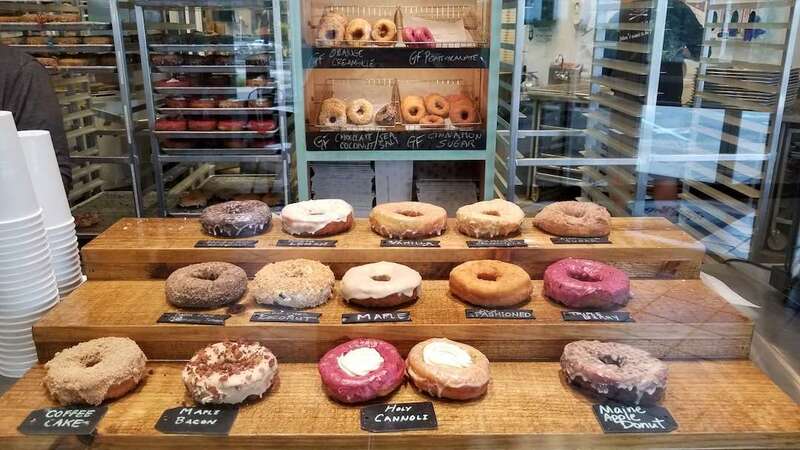 The last suggestion I have for you on your Portland foodie adventure is on the sweet side. We don’t care for sweets to much – I mean if it’s there, it’s likely we’ll try some, but we don’t often seek out desserts. Doughnuts are one of our sweet weaknesses. We love a good doughnut! 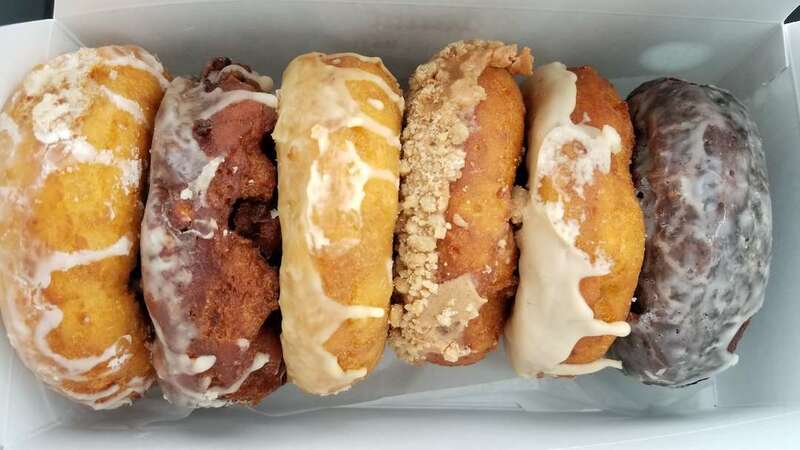 The Holy Donut has several locations, and make their doughnuts out of potatoes. They’re slightly denser because of that, but just as delicious! We couldn’t just choose one flavor. I mean come on! Now that I’m hungry…let’s shift gears and reminisce about all of the delicious breweries we visited! 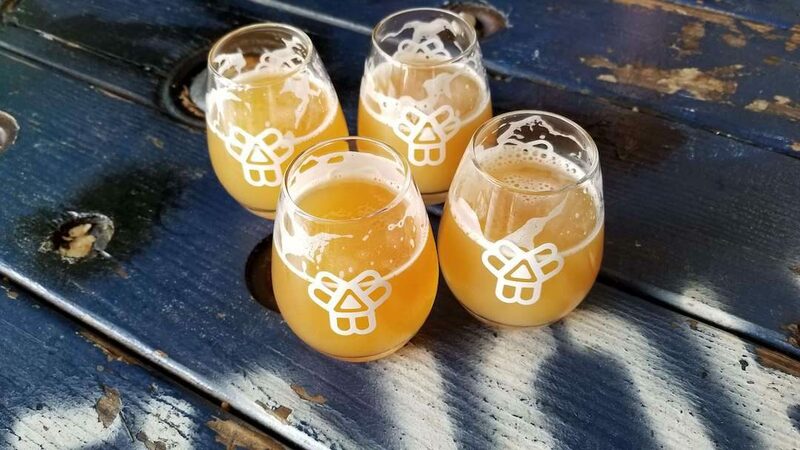 While we spread our food and beer adventures out over a few days, we did one big tour day to several breweries because of their optimal locations to each other. 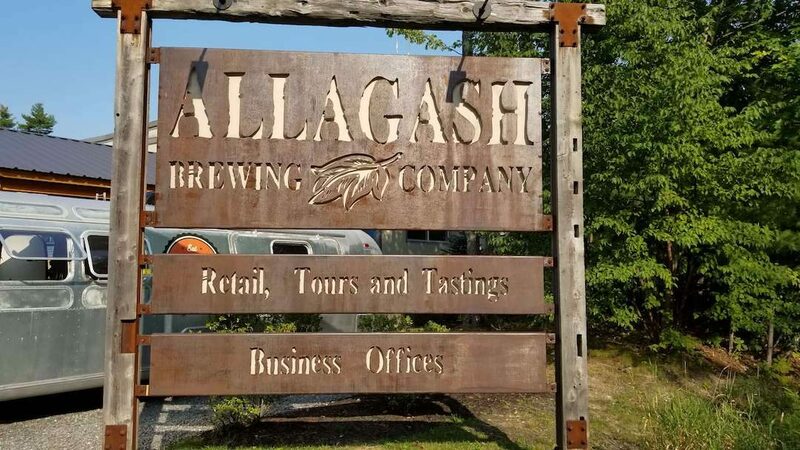 We started at Allagash brewery, which is a more well known brewery and available in Florida. They aren’t allowed to sell beer, so you are given a ticket and a flight of their four samples for the day. If you feel so inclined to buy the beer for home, you can buy packaged beer, but are not allowed under any circumstances to drink it on site. 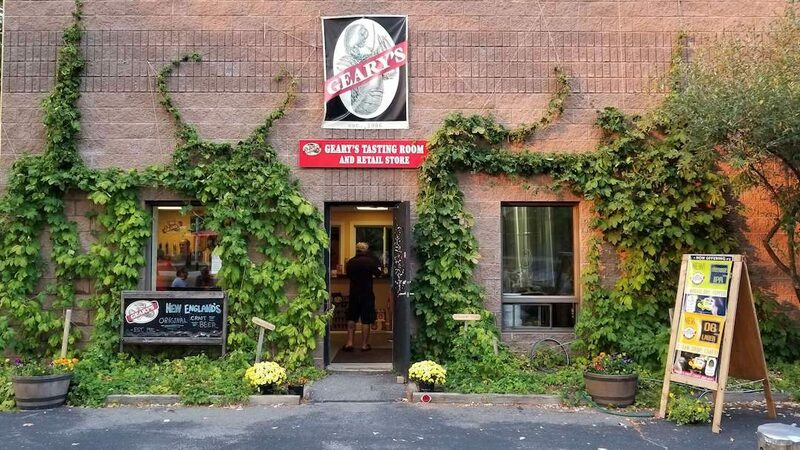 Their brewery is beautiful and offers tours – reservations for a tour is highly recommended. After, we walked across the street to Foundation Brewery. They had a very different vibe than Allagash but had AWESOME beers. We liked the variety in the styles, often times breweries stick to the classics and have an overwhelming amount of one style of beer. 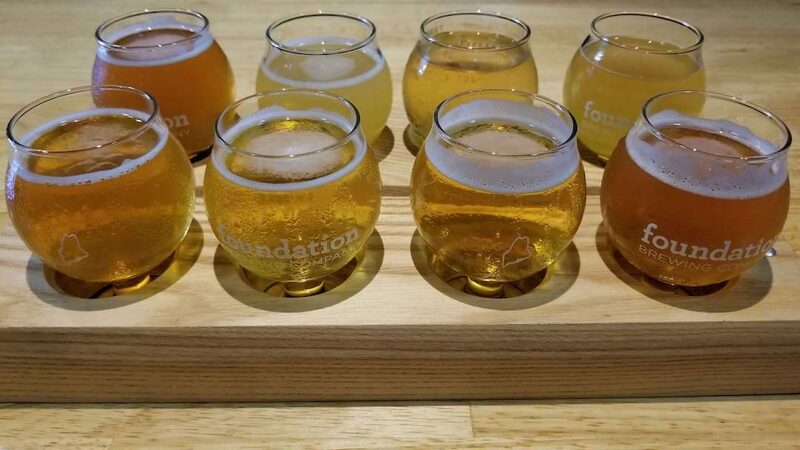 Foundation had a nice combo of styles and unique flavors to boot. 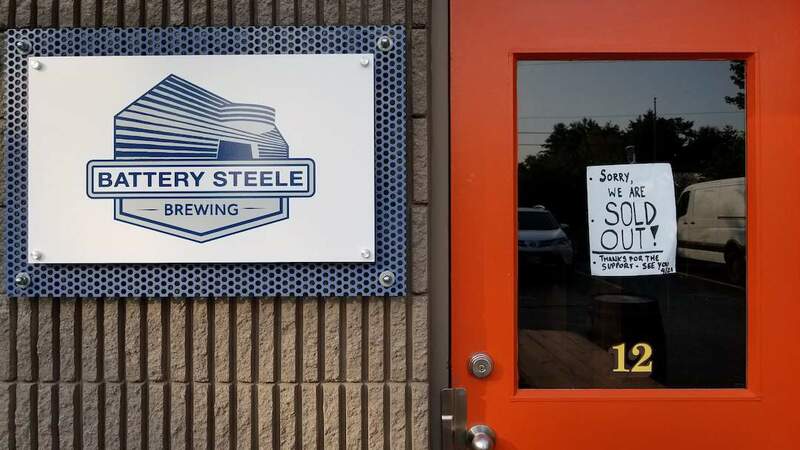 They’re located in a larger industrial complex, that has two more breweries on the other side, Battery Steele and Austin Street Brewery. Unfortunately Battery Steel was closed. 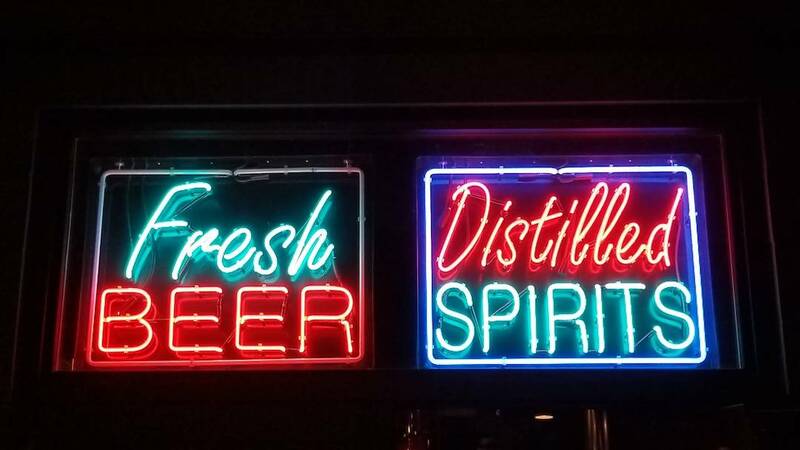 We were told from a bartender that they typically sell out within a few hours and open up a few weeks later when they have a new batch ready for sale. Getting their beer can be a challenge but sounds like it’s worth it! Austin St. had a small selection, but again was quality and delicious. The last stop in the area is D.L. Geary Brewery which is Portland’s original or “first” craft brewery. They had a one of each style you’re probably familiar with. Super small operation, but overall great beers. Doing a self guided walking beer tour in this little area of Portland is highly recommended and was a great way to spend a day! We also visited a few other breweries in the greater Portland area. 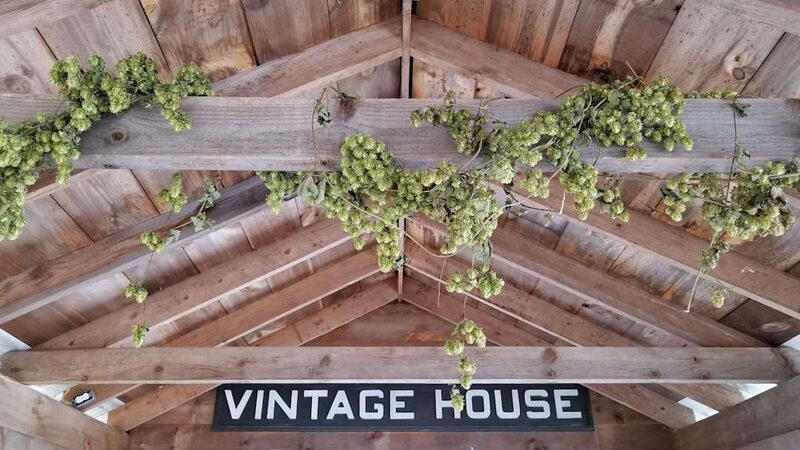 On our way down to Portland, we camped at a Harvest Host spot for two nights in Boothbay at Boothbay Craft Brewery. The grounds were beautiful, they had a ton of beers on draft (yes our flight is like 20 beers), and had the most adorable decor inside. It felt like a warm, inviting, eclectic British pub. Their menu had a ton of delicious options as well. If you’re up for a drive, or coming down the coast to Portland definitely make a stop here! The first night we arrived, we decided to grab a few drinks at a beer bar our friend suggested to us, Novare Res Bier Cafe. Their selection of local beers, their own beers (not a huge selection but they had a few), and overall northeastern and international beers were awesome! We met a super cool bartender and thoroughly enjoyed our time there. 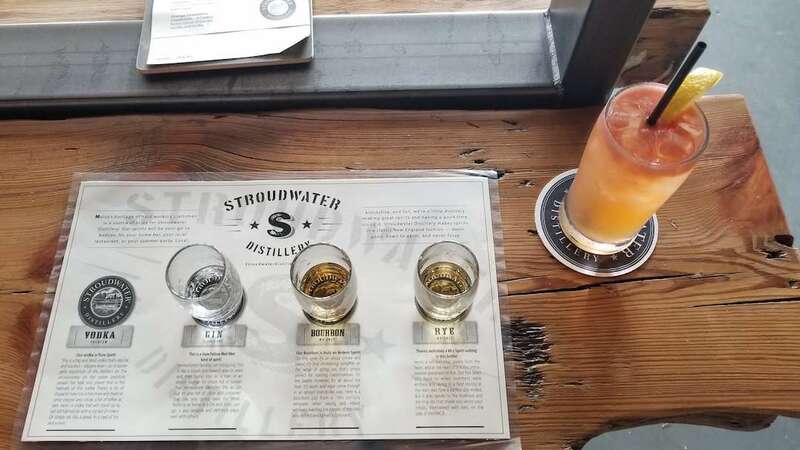 Outside of town a bit, there is Bissell Brothers Brewery and Stroudwater Distillery. There is also a vineyard’s tasting room in the same complex, so you can walk from stop to stop enjoying a variety of drinks. 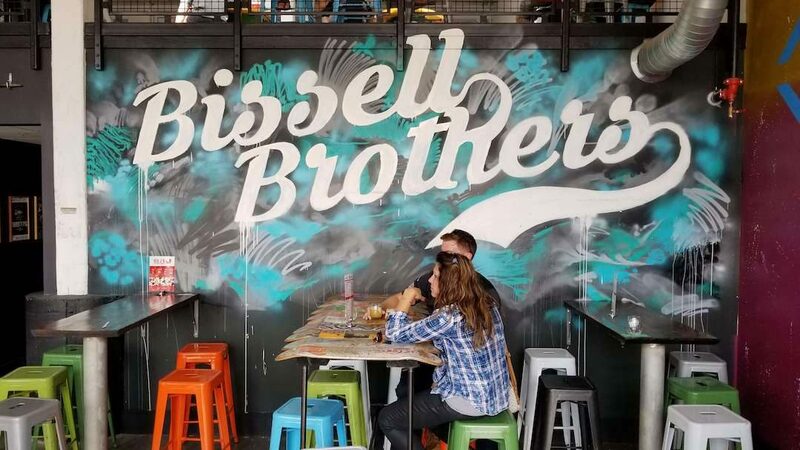 We weren’t blown away by Bissell Brother’s beers. They were good, don’t get us wrong, but all very similar and hop forward. There was a lack of variety and ingenuity in their recipes. The actual brewery was really nice, and had a ton of cool graffiti art and pieces to keep you interested for hours. The distillery two doors down opened their doors fairly recently and are still very small batch. We got our own little private tour from the bartender. Dennis tried a flight and Liz enjoyed a delicious hand crafted cocktail from their gin – which was awesome! Well worth a try if you’re into spirits. Overall – we love this place and cannot wait to go back and indulge some more! It’s a beautiful town on the never ending gorgeous coastal Maine that has a ton to offer. Hope you enjoy the photos as much as we enjoyed eating and drinking them!